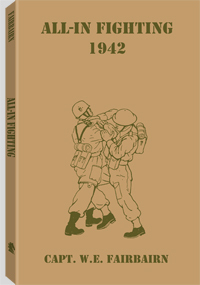 130 pages, 5.5" x 8.5"
This hard-to-find 1942 classic on hand-to-hand combat from Capt. W.E. Fairbairn – one of the most respected names in close-quarters combat – is finally available to collectors of World War II-era literature and practical, ruthless fighting instruction in its original, all-inclusive British version. All-In Fighting, published in the United States with the title Get Tough, was written to introduce soldiers and civilians alike to the realities of close combat. As Fairbairn states in his introduction: "Some readers may be appalled at the suggestion that it should be necessary for human beings of the twentieth century to revert to the grim brutality of the Stone Age in order to live. But it must be realized that, when dealing with an utterly ruthless enemy who has clearly expressed his intention of wiping this nation out of existence, there is no room for any scruple or compunction about the methods to be employed in preventing him." Featuring the same clear, no-holds-barred information as Get Tough, but with an expanded introduction by Fairbairn, a preface by Lieut. Colonel J.P. O'Brien Twohig and a section on rifle and bayonet fighting by Capt. P.N. Walbridge, All-In Fighting covers strikes, holds, releases and more, all vividly illustrated. Original copies of this book are highly sought after and, when they can be found, command a high price. This exact reproduction from Paladin Press offers every collector a chance to add Fairbairn's legendary wisdom to his personal library. Captain W.E. Fairbairn taught unarmed combat to the famed British Commandos and the U.S. armed forces during World War II. Before the war he served as assistant commissioner of the Shanghai Police Force. He was the inventor of the Fairbairn Commando Knife and the author of the classics Get Tough and Shooting to Live.